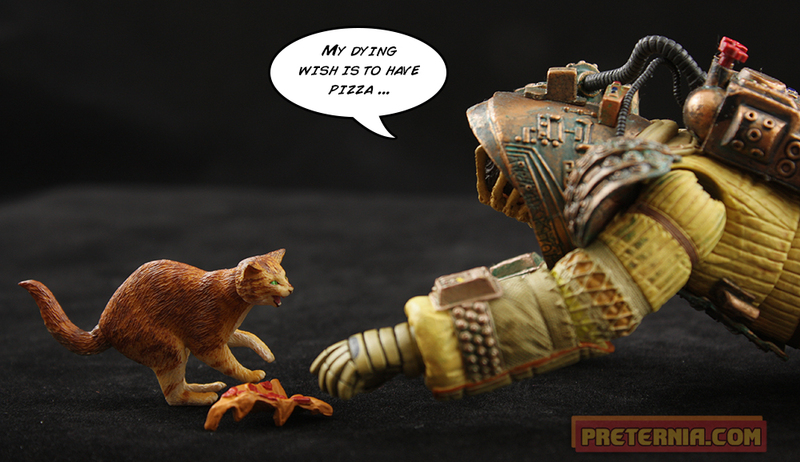 Posted by Jon in NECA, Review with 7 comments. Our first Ripley variant for 2015! 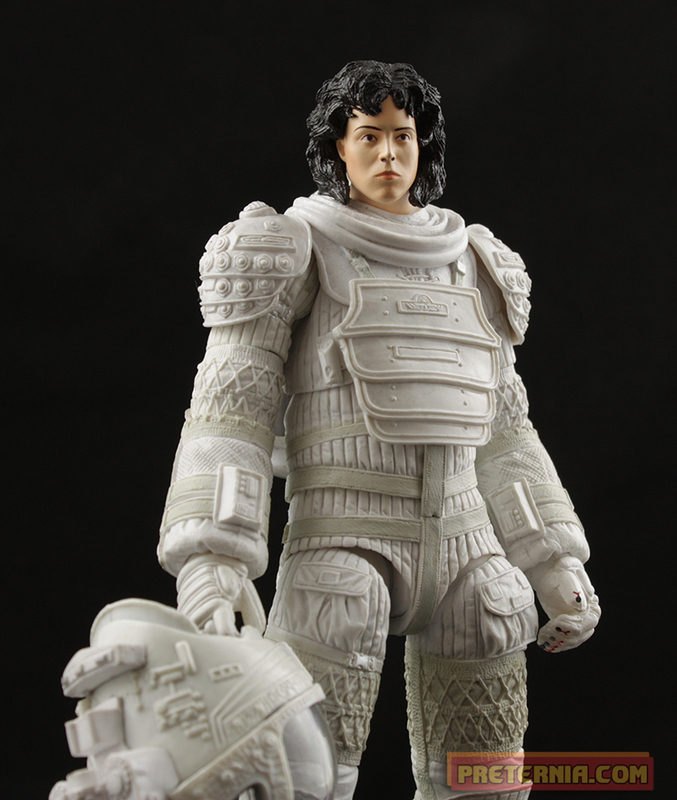 Yes, this fourth wave of Alien figures comes with a second Ripley. 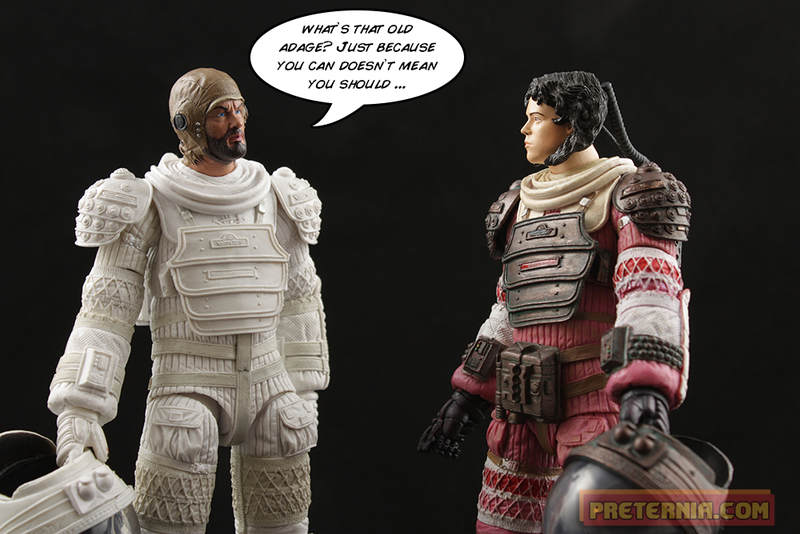 You may recognize the body as the same Nostromo suit that Kane was wearing in wave three; as well as Dallas in this wave. I don’t think I ever reviewed Kane, but I’m a big fan of the suited body NECA put together. It looks as though they also made some slight improvements to it between waves. Most notably they let the paint dry a little longer before packing her in the clam shell. Kane came with some sticky wet paint on the bronze part of his suit, mostly the backpack and shoulder pads. There is no hint of wet paint on either Ripley or Dallas. The elbows also feel like they have a slightly better range of motion. The only other changes (besides the paint) are that the crotch piece has been removed and the gloves are a new scene accurate sculpt. So is this just a head-swap with Jumpsuit Ripley? No it is not! Well, maybe it is in a way. The hair is a completely new sculpt so that her head can fit in the helmet. The face looks like it could be the same sculpt, although my eyes may deceive me and she looks as though she has a bit more interested facial expression. That could also be due to paint differences. Speaking of paint I have one slight blemish on an otherwise flawless face: one of her nostrils is too big! Her right nostril bleeds down below the nose just slightly, but it gives the illusion that one of those X-Files black oil monsters are seeping out of her nose. Having three Nostromo suits in my possession I do have a bit of a pro-tip for getting the helmets in snugly. Put the front tab in first or it will never sit securely. I battled this very issue with Kane for many months until one day it just dawned on me. Changed my life forever! The suit is a white repaint, but it does have a couple nice painted details. Most notably the fingertips of the hands have the little red and black “Y” shown in the movie. It’s a nice little touch that I think a Mattel might pass on to save some cash on PAINT APPLICATIONS! There are also some silver buttons on the backpack and on the back of the helmet. I guess what I’m getting at here is that the suit is fairly simple paint-wise, but has the appropriate paint details as needed. Ripley comes packed with her helmet, Jonesy, a harpoon gun, and two harpoons. I’m a big fan of this Jonesy because he’s angry. He has the same single articulation point in the neck as the other, but having a litter of 1/12 scale cats is a great feeling! The harpoons can be loaded into the gun as needed, and come in an open and closed variety. I think that both versions of Ripley in this wave have a very good Sigourney Weaver likeness as well as great paint backing up those sculpts. At the sub twenty-dollar price point NECA seems to be keeping these figures at you aren’t going to find much better of a value these days. 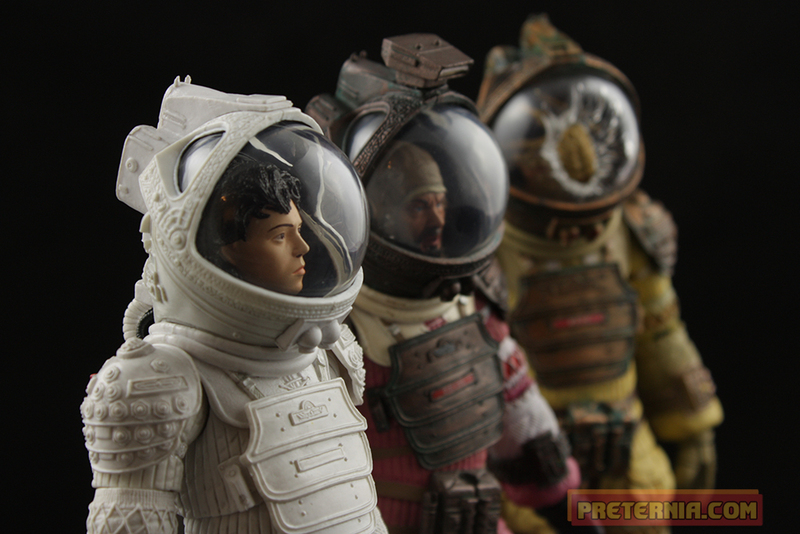 These guys are hitting retail right now, but can also be grabbed over at NECA’s Amazon store! I’m the impatient type so I go there for all my new Alien needs. 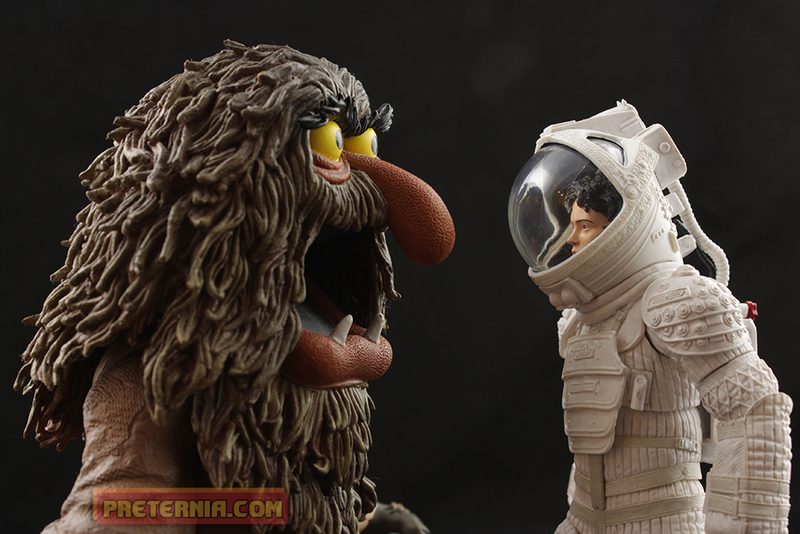 I’ll preface this by saying I ADORE the Nostromo suit that NECA has constructed for these figures. That said I think I am good now. I don’t need any other figures wearing this suit going forward. That being said if a Lambert or somebody was announced tomorrow or at SDCC wearing this suit I’d probably buy it. I’m weak. I couldn’t even go a paragraph before backing down on that stance. I had a Sweetums laying around from some cleanup … I think it works! Excellent review! I haven’t bought any Aliens figures since Sgt. Windrix last year but the new Ripley figures are definitely tempted. I’m going to at least need one of them! Excellent review, and photography to go along with it. One question, though. How did you get the helmet to fit snugly in the collar? I can’t seem to shove mine down without leaving an aesthetic-ruining gap. Take the top half off, and then push in the part to the front of her body first. Then the back will slide in. It took me forever to figure it out, but now that I do it all three of mine fit perfectly. Good luck! Thanks for the advice! In the end, though, I think it may be due to the specific, item molding of the collar flange on the helmet. Looking around, it seems to be a common enough imperfection. I’d suggest that anyone experiencing the same problem do what I’m doing and reshape away some of the excess plastic with a hobby knife. 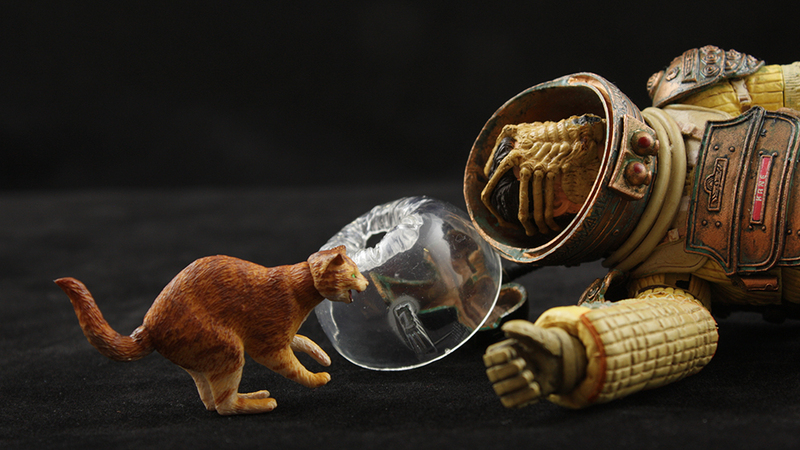 Not wild on altering NECA’s great sculpts, but it’s the only way in this, and possibly other cases, to make it display worthy. I got the front flange to fit (first, as per your advice) flush, now all I need to do is tailor the rear a little. If worse comes to worse, the helmet won’t fit as snugly as it should. I’m having a hard time getting the helmet to go past her nose, since the wide hair sculpt doesn’t allow me to turn the head sideways to pass through the opening, like with the Dallas figure. I’ve already left a small dent on the nose bridge trying to force it. Take the head off first! It pops right off and you can place the base on, makes it much easier.